Despite the food plated exquisitely before you, you are not sitting down to a meal. You, my friend, have brought yourself to this table for the hero’s journey. Through these courses you will journey through the Golden Fleece of bio-engineered wheat fields; you will see white clouds of meringue greyed with the smog of your home. You may even be forced to slay the comfort foods of Mother in an Oedipal confrontation. 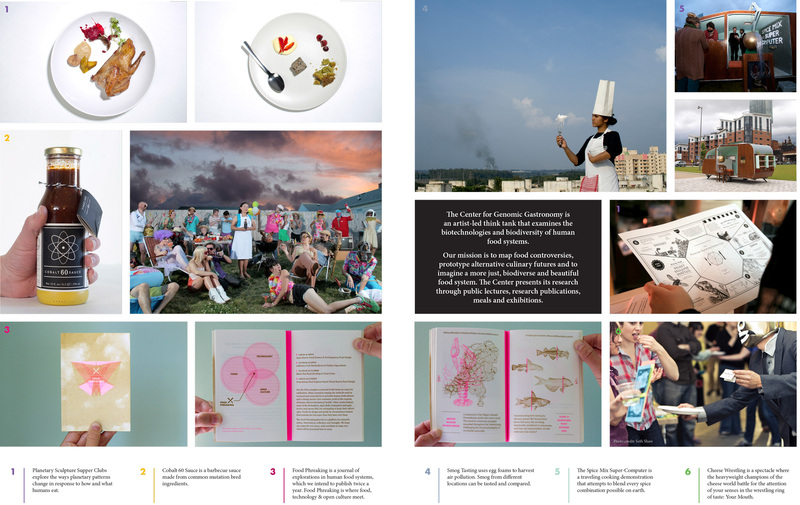 The Center for Genomic Gastronomy is an artist-led think tank that seeks to fully explore the biodiversity of the biotechnology of human food systems. This is art and exploration into the most universal media of the human race. 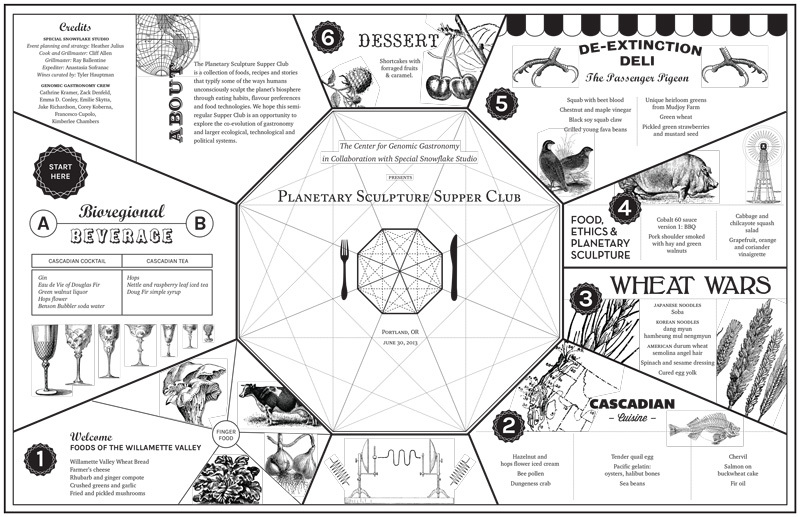 This art doesn’t just ask the questions but seeks the answers to global food problems. It speaks to all who have the strength to taste it. Zack Denfeld and Catherine Kramer founded the center in 2010. Since its founding, the think tank has added Emma Conley and Heather Julius to its collection of philosophers, scientists, chefs, and artists. This is our cultural leadership hard at task, our best people seeking mischievous and whimsical answers. The voice of global art is changing faster than can be properly categorized, but the works of The Center for Genomic Gastronomy provide the clean edges and idealism of Modernism in a manner that can only be educated by the death of Postmodernism. With overtones of shock from performance art, every dish is served with a side of education, dictating the very taste and plating of your meals. 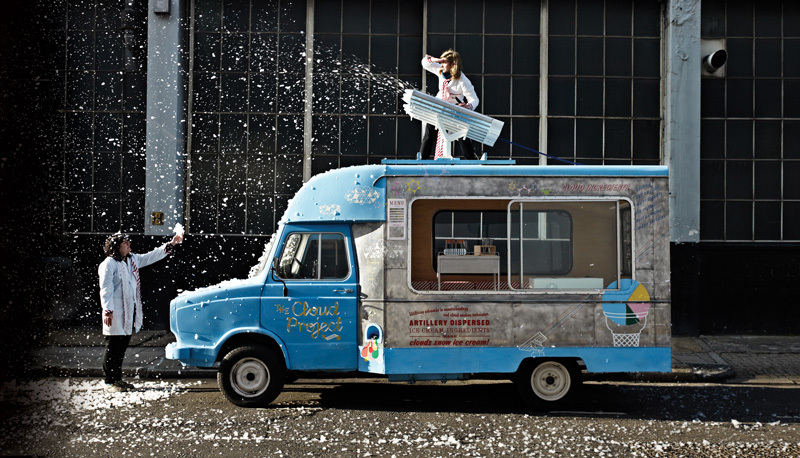 The Center uses food as a relational jumping-off point for the hot button topics of global pollution by serving meringues flavored by smog from different parts of the world. They lead us into discussing our hidden food history with their barbecue sauces, made strictly of crop varieties that have been intentionally mutated through exposure to high doses of radiation. To be clear, at no point will your corporeal body be endangered by what is fed to you, but your concepts of why GMOs are necessary, and what our future looks like, may be. As Zack says, “We are creating provocation to encourage the public to ask questions.” This is the art of social engagement. The Center’s research, though conducted in fine arts and culinary settings, is of sound historical and scientific basis that cannot be dismissed. Ortolan, for example, is considered the cruelest dish ever created and is illegal to prepare in many parts of the world; so CGG created vegan ortolan. The plating of this dish—its small vegetable flesh, neatly sculpted into the face and body of the bird nesting in a bit of garnish—mimics the drowned and cooked bird body to perfection. The Center’s website says it best: “The traditional preparation of the ortolan bird in France demands that they are captured alive, force-fed, drowned in armagnac and eaten whole. Although it is illegal to prepare and eat, the dish retains a forbidden attraction for some adventurous eaters. The Center for Genomic Gastronomy’s dish is intended to be consumed in the traditional way—with a large napkin covering the head and the face—to keep the flavors in and to hide one’s shame from God.” genomicgastronomy.com/work/dinners/vegan-ortolan. The artworks from this Portland-based think tank have hit a nerve globally: Their works have been invited to exhibit in Singapore, India, England, Norway, Scotland, Denmark, Spain, Finland, Germany, Portugal, and China. As their fame has grown, Kramer says the group gets to pick their projects more closely, but they still live the lifestyle of the itinerant artist, moving from event to event to further their work. They often get the chance to exhibit locally, at galleries such as gallery HOMELAND and 1000 Grand Gallery, and often partner with the Special Snowflake Supperclub and Studio of the same name. Currently their work is on display at the San Jose Museum of Fine Art; and in Portland with a food cart—of course—at the Time-Based Arts festival this coming fall. 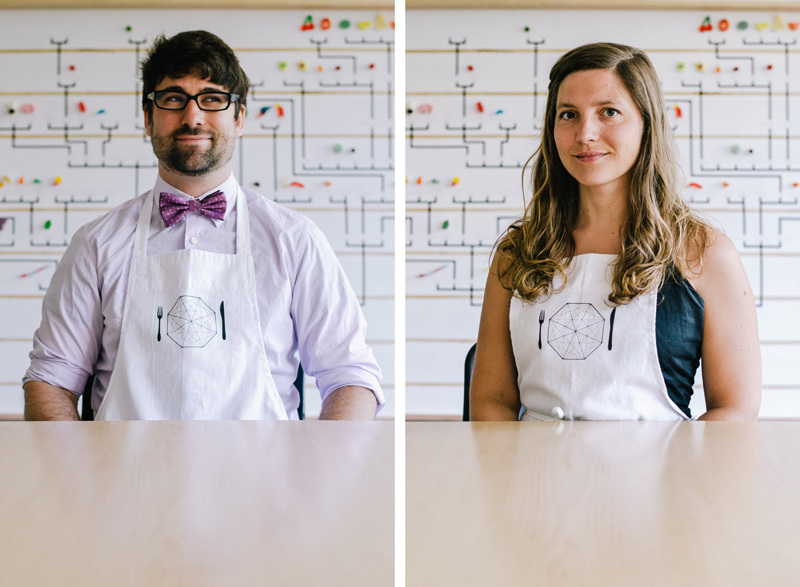 Don’t wait to experience the work of the Center for Genomic Gastronomy firsthand, though. Often hidden about our fine city is the Seed-O-Matic snack machine. This eco-friendly sculpture will gladly vend you heirloom seeds, as well as organic soil to grow a fine bit of their work. And once you have the snack in hand, check out two books from their press, Food Phreaking or Eat Less, Live More…And Pray for Beans—for the content is as artistic and thought-provoking as the food.